Decide how you plan to use the garden shed. Will you only use it to store items like the lawn mower, leaf blower, DIY tools and the sprinklers and hoses during the off season? Do you need extra space to store other seasonal items like patio furniture during the winter? Will you use the garden shed for planting and potting plants? Sorting seeds and bulbs? Do you simply want a quite retreat where you can go to get away from it all and enjoy your hobby from time to time? Determine the size of the shed you’d like to build. If you have a small lot or space, your lot may dictate the size of the garden shed. But, if space is not an issue, knowing how you plan to use the shed as decided above, will help you determine what size garden shed you will need. Keep in mind some garden shed plans are available with a loft providing extra overhead storage, ideal for a restricted lot. If you have plenty of room and you’re not on a tight budget, you might consider building your garden shed a bit larger than your needs actually require. Extra room is always appreciated, and you never heard of anyone complaining they built too big a shed, have you? How often will you use your garden shed? If you plan to spend long stretches of time in the shed on a regular basis, you might want a few amenities like windows or lighting, a planting bench or work surface, and a utility sink. Likewise, if you plan to charge batteries for DIY tools or plug-in other electrical items, you’ll have plan for electrical outlets. What kind of access will you need? Depending on how you plan to use the garden shed will influence the door size and style you choose. Do you need a single service door, a double door entry or an overhead garage door? Consider your budget. If you have a tight budget, make sure you stick to it. Look for deals on lumber and other building materials to keep from overspending. If there is no wiggle room in your budget, you might have to sacrifice some of the special features you were originally hoping for, like the utility sink, to keep from going over budget. Research local building codes. 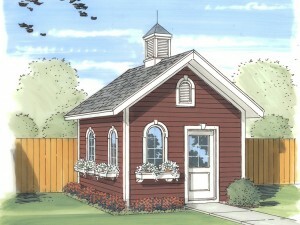 Before buying a garden shed plan find out if you’ll need to get building permits. Ask your local building department what other building codes you must follow. Some municipalities have height and size restrictions. Other areas must follow building codes based on local weather and climate conditions. Doing a little research ahead of time may eliminate some headaches when you are ready to start building. If you are considering building a backyard garden shed, these helpful tips will help you get started on your project. If you’d like to view the types of garden shed plans available, please visit The Garage Plan Shop and browse our collection.